“I just don’t want to be on my death bed thinking, ‘I shouldn’t have had the chocolate cake.’,” she said and we both cracked up laughing. Can you imagine holding on to the guilt of a food choice even at the very end? This is the thought that brought it all into perspective for her. It was time to let go of the food guilt. One of my jazzy one-liners that gets people laughing in a first appointment is, “food is secular. It’s not going to send you to heaven or to hell.” It’s absurd to think we even have to point that out, but there in lies the power of the statement. 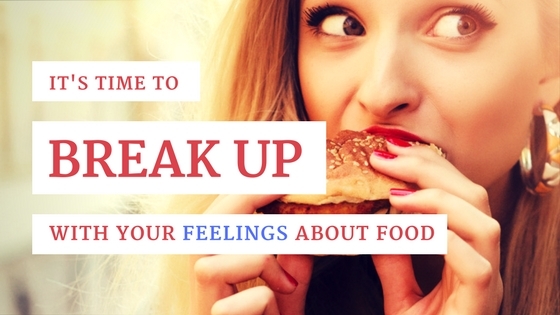 Most people do have a lot of emotional energy about their food choices. I mean, think about it – if you were ever taught that your weight was a determining factor in your worth (and most of us have been) then yeah, it stands to reason that we have invested a lot of shame into our eating habits. And don’t even get me started on how our society plays into this mess – that’s a blog for another day. After a good chuckle about the realization that a banana is just a banana and it doesn’t hold the power to save us or condemn us, some people push back on the idea that they should work to overcome the food guilt. Why you ask? From what I have ascertained from many, many conversations on this topic, clients believe that food guilt is the motivator to better choices next time. In their mind it goes like this – “ugh, I shouldn’t have stopped to get that milk shake. I can’t believe I did that. I am disgusting.” And that self-shaming is supposed to remind them they are better than that so that they can make a healthier choice next time. But here’s the thing. When I asked them how long they have been using this practice to achieve better health, they sigh heavily with exhaustion in their voice and say, “for a very, very long time.” And I ask, “do you believe that this practice has served you well?” Then it hits them. If it actually was serving them well, it would stand to reason that they wouldn’t still be struggling with their food choices and weight. This self-deprecation thing we have going on with food is a very abusive relationship. It keeps us stagnant and routinely undermines our sense of worth. It has not served our intended purpose and so it is time to embrace a new way of dealing with this. Just like any bad relationship, it can be tough for people to give it up. Some people even argue with me over the merits of the behavior! Believing you are disgusting because of your food choices does not increase your likelihood of choosing healthy foods next time. However, when people believe and acknowledge that they are worth caring for…then they increase their likelihood of making better choices for themselves. This – this stepping into your worthiness though – is really hard work. We have to overcome decades of familial and societal messaging that tells us that in fact, we will be worthy when we achieve <insert next life goal>. I mean how could they sell make-up if our worthiness wasn’t at least a little bit on the line? Think about it. And they definitely sell weight-loss the same way. With the sales line, “be who you were meant to be with our amazing weight-loss thing.” what else are you to think, right? This is where the counter-cultural, post conventional wisdom work starts. For almost every time you buy into that narrative or begin to write it yourself, you have to first recognize it is happening and then be radically kind to yourself. This is hard to do because the conversation in our head goes totally unchecked. No one hears that but us, and we can let it get pretty mean in there. So you have to notice it happening and choose to check it yourself. The choosing to check it yourself gets easier when you start to believe this is a valuable practice. Then, the radically kind thing. Yikes! How many of us can say that it comes naturally to us to think nice thoughts about ourselves throughout the day? It feels quite awkward when you practice it. But it WORKS! It’s like how the yogis keep telling us we can find zen if we really commit to the practice – this is one of those things that really works if you commit to the practice, but luckily it doesn’t require a mat or flexibility. The work is hard. Letting go of your self-abuse and practicing radical personal kindness is hard. But, like my friend, I don’t want to be on my deathbed worrying about the calories I ate. I certainly don’t want to be on my deathbed wishing I would have let go of all of that long ago and been kinder to myself sooner. Aside from the benefits of not thinking about nonsensical things on your deathbed, this also has the side affect of actually helping you take better care of yourself through healthy food choices while you’re still thriving. When you let go of the emotional roller coaster, a salad becomes just a salad that you may enjoy or your may not, and a trip to your favorite restaurant is enjoyed for the experience, no guilt required. But don’t take my word for it. Ask some of my clients on my Facebook page. They have been diligently working on being kinder to themselves and seeing a banana for what it really is – just a piece of fruit. Oh, I need to get there! Fingers crossed!